The holidays are winding down, but they aren’t over yet – New Year’s Eve is yet to come. Many people use the week between Christmas and New Year’s Eve as a time to relax after the hectic rush to celebrate. Employee Alex did just that with this week’s edition of our Recipe of the Week series with a Bacon Apple Cocktail recipe. Keep reading to see if you might want to add this one to your New Year’s Eve celebration plans. This is the last Recipe of the Week for 2017 but we will be back in 2018 with more great maple syrup recipes for you and your family. Thanks for a great year! First, as always, a disclaimer: Maple Valley Cooperative does not condone the consumption of alcohol by minors. Alcohol should always be consumed responsibly by adults 21 years and older. Similarly, we do not condone operating a vehicle while under the influence of alcohol. If you intend to drink alcohol, please designate a sober driver or other form of safe transportation. Hi Guys! Alex here with another Recipe of the Week for you. Can you believe 2017 is already over? What a year it has been! 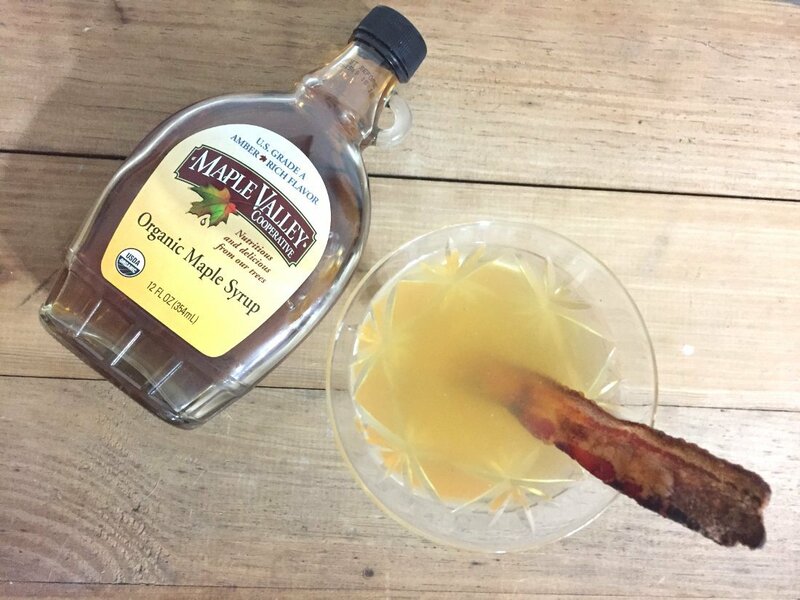 I have had a great time testing out and sharing maple syrup recipes everyone and I look forward to continuing to do so in 2018. I hope you had a wonderful year and you are looking forward to the next! Okay, so lets get started with this recipe. I decided to do another cocktail recipe this week for multiple reasons. 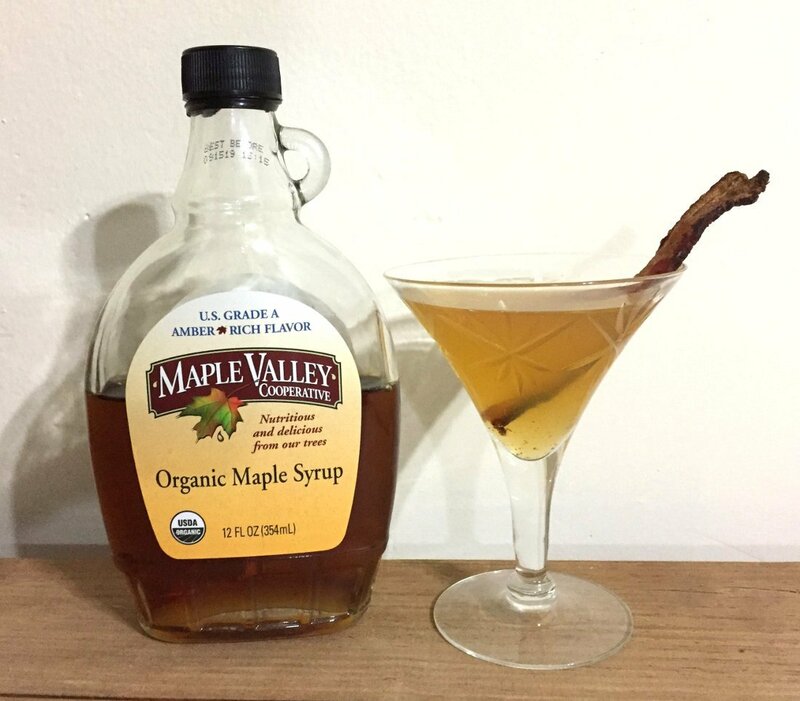 First, I was inspired by last week’s maple beverages post. Secondly, this Saturday, 12/30 is National Bacon Day and I wanted to celebrate in an unconventional way, and I already made Maple Bacon Dip. Finally, I didn’t want to do anything too difficult with how busy this time of year is. 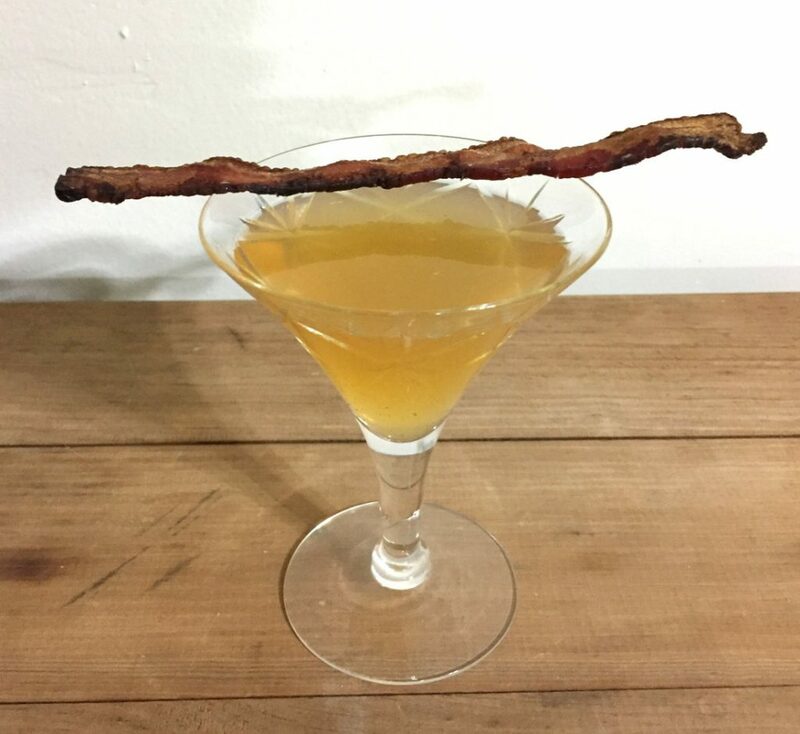 Luckily, I found the perfect recipe for inspiration; the Bacon Me Angry cocktail from The Spruce! The Spruce’s cocktail calls for bacon-infused vodka (luckily they tell you how to make this), maple syrup, bitters, hard cider, and bacon & a brandied cherry for garnish. I decided to make a couple of modifications to this recipe to suit what was available to me. I decided to use a home-brew hard cider that we made earlier this fall from some apples from the trees on our property. Since this cider is already more bitter than a commercial hard cider (no added sugar), I decided to skip the bitters in the original recipe. I also did not have access to brandied cherry, so that garnish was skipped as well. 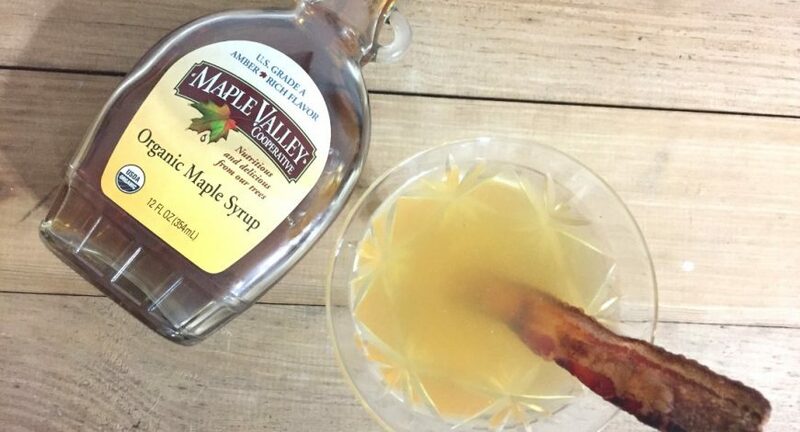 The Spruce offers some helpful directions on how to make this bacon vodka using actual bacon fat. I started with a small bottle of cheap vodka (my biggest mistake) and poured it in to a mason jar. 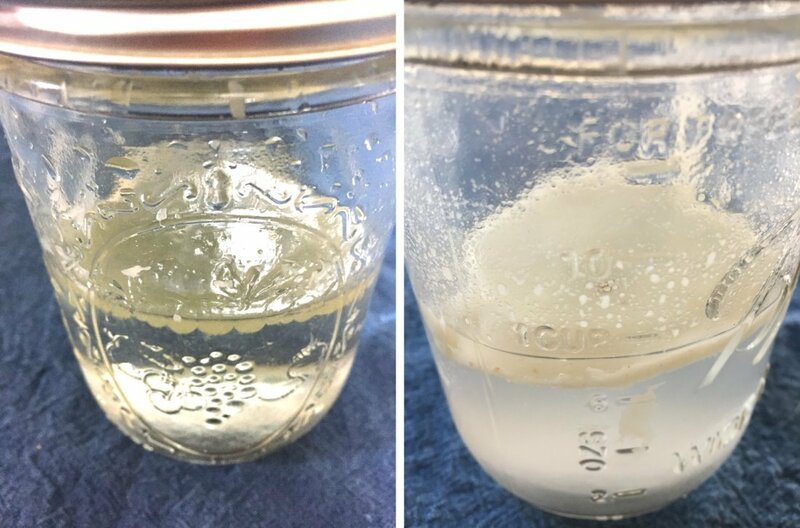 At our house, we save organic baking fat for cooking so I grabbed the jar from the fridge and, without measuring, grabbed a spoonful and heated it up to a liquid state. As I discovered this hard way, this will not work with a cold and solidified bacon fat, so make sure yours is melted. After adding the bacon fat to the vodka I put the lid on the jar and shook it hard. 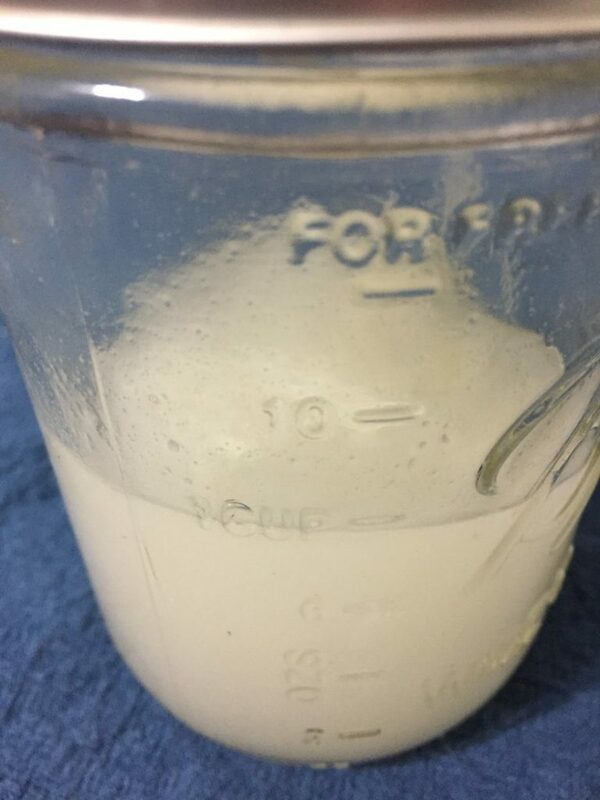 The vodka turned a cloudy white color, but most of the fat still floated at the top. I left this mixture on the counter overnight (the recipe states to leave it sit for 4-6 hours). 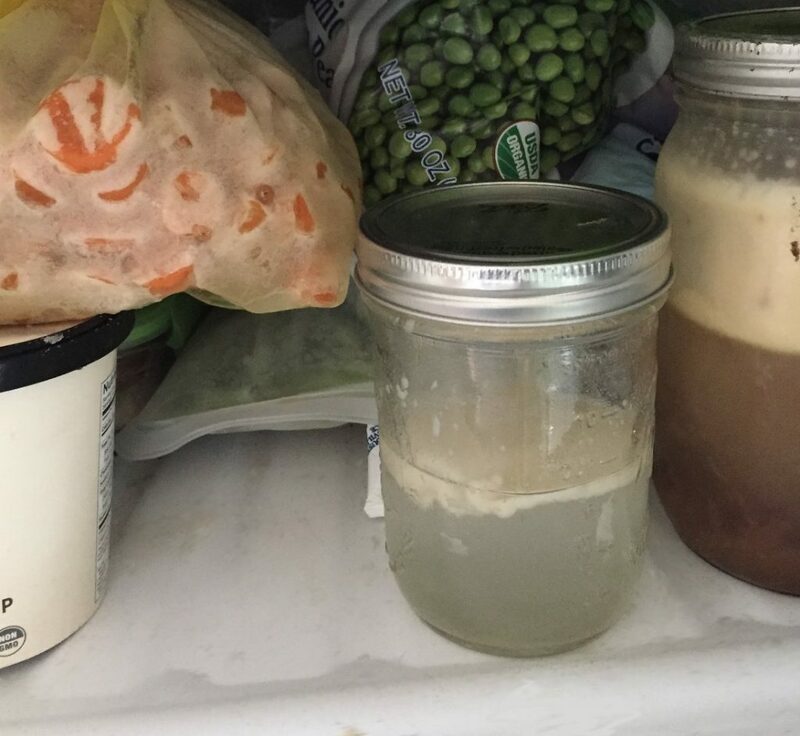 The next morning, I put the jar in the freezer as recommended to solidify the fat. After a few hours, it still had a cloudy appearance, but the fat had formed a disk at the top of the liquid. Straining the vodka through a strainer was easy as most of the fat was together. As I already mentioned in the Campfire Sour Recipe of the Week, I am not fancy enough to have a drink shaker in my home, or even ice on most occasions. Instead, I poured the contents into another mason jar, put on the lid and shook it up. The vodka was still cold from the freezer and the cider had been in my fridge, so the ice wasn’t needed anyway. 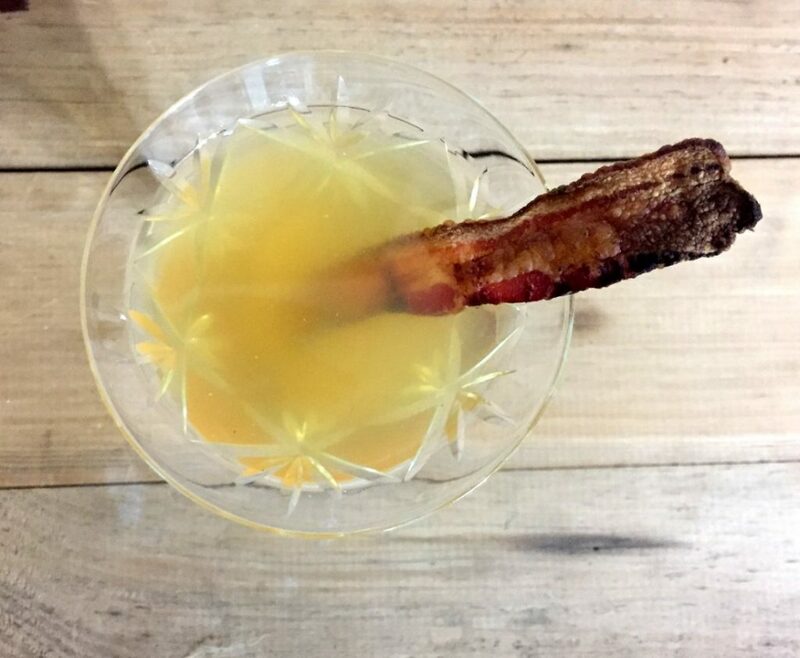 I poured the mixture into a cocktail glass and garnished with a slice of bacon I had saved from breakfast. The final cocktail was… interesting. I could definitely taste the bacon flavor and it went well with the cider. However, I should have used a more expensive vodka because the flavor of the vodka overpowered everything in an unpleasant way. I also found it strange to have the bacon flavor in my drink. Usually, such a thing is reserved only for a Bloody Mary. Overall, the flavor was not terrible, but I don’t think I’ll be making this one again. If you have a bacon lover in your life, they might like it though. Just make sure you use a quality vodka. Happy New Years! Did you try this recipe at home? Let us know how it went in the comments section!